:The loss or disaffiliation of young adults is a much-discussed topic in churches today. Many faith-formation programs focus on keeping the young, believing the youthful spirit will save the church. But do these programs have more to do with an obsession with youthfulness than with helping young people encounter the living God? Questioning the search for new or improved faith-formation programs, leading practical theologian Andrew Root offers an alternative take on the issue of youth drifting away from the church and articulates how faith can be formed in our secular age. He offers a theology of faith constructed from a rich cultural conversation, providing a deeper understanding of the phenomena of the "nones" and "moralistic therapeutic deism." Root helps readers understand why forming faith is so hard in our context and shows that what we have lost is not the ability to keep people connected to our churches but an imagination for how and where God could be present in their lives. He considers what faith is and what steps we can take to move into it, exploring a Pauline concept of faith as encounter with divine action. 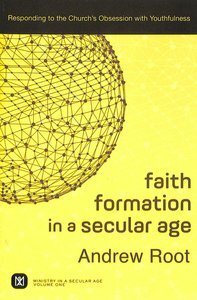 About "Faith Formation in a Secular Age: Responding to the Church's Obsession With Youthfulness"
Andrew Root (Ph.D., Princeton Theological Seminary) is assistant professor of youth and family ministry at Luther Seminary in St. Paul, Minnesota. A former Young Life staffworker, he has served in churches and social service agencies as a youth outreach associate and a gang prevention counselor. He is the author of Revisiting Relational Youth Ministry: From a Strategic Influence to a Theology of Incarnation and Relationships Unfiltered: Help for Youth Workers, Volunteers, and Parents on Creating Authentic Relationships. 11. Is God A Favor Bestower Or Gift Giver?